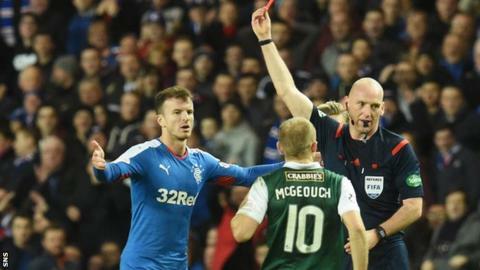 Rangers will appeal the red card shown to midfielder Andy Halliday during Monday's 4-2 win over Hibernian. The 24-year-old was ordered off in the second half of the top-of-the-table Scottish Championship game. Halliday was alleged to have aimed a kick at Fraser Fyvie before the Hibs midfielder clutched his face after the two players came together. Manager Mark Warburton said he did not wish to comment further while the appeals process is ongoing.